Jackson MacKenzie has helped millions of readers in their struggle to understand the experience of toxic relationships. His first book, Psychopath Free, explained how to identify and survive the immediate situation. In this highly anticipated new book, he guides readers on what to do next--how to fully heal from abuse in order to find love and acceptance for the self and others. Through his work with thousands of survivors of abusive relationships, Jackson discovered that survivors frequently have symptoms of trauma lasting long after the relationship is over. These may include feelings of numbness and emptiness, depression, mood swings, isolation, perfectionism, rumination, caretaking and people-pleasing, a need for control, physical maladies, substance abuse, and more. But he also found that it is possible to work through these symptoms and find love on the other side. Through a practice of mindfulness, introspection and exercises using specific tools, readers learn to identify the protective self they've developed - and uncover the core self, so that they can finally move on to live a full and authentic life--to once again feel light, free, whole, and ready to give and receive love. Like Brene Brown's The Gifts of Imperfection and John Bradshaw's Healing the Shame that Binds You, Whole Again offers hope and multiple strategies to anyone who has survived a toxic relationship, as well as anyone suffering the effects of a breakup involving lying, cheating and other forms of abuse--to release old wounds and safely let the love back inside where it belongs. Start reading Whole Again on your Kindle in under a minute. "In Whole Again, Jackson MacKenzie lays open some of his own personal wounds to advise on how scars from past traumas can heal. He describes how development of a 'protective self' can provide acute, numbing relief from emotional pain, but at the expense of more enduring self-acceptance. MacKenzie addresses co-dependency, addiction, post-traumatic stress, and borderline, narcissistic, and other personality disorders, outlining pathways to achieve forgiveness and discharging shame. This book may help fill in the holes that can make you whole again." "Jackson's book is an empathetic gem of true knowing. Dismantling the effects of trauma can be a daunting undertaking. Whole Again is a compassionate guide. It takes your hand and encourages you to keep going, prompting you to build a power base of self-discovery that takes you home to yourself. All true healing happens within, which in turn offers you the miracle of hope." "In Whole Again, Jackson MacKenzie has synthesized the important basic principles and tools of healing and writes in a style that is both warm and articulate. Whole Again offers a good starting point for those not yet ready for therapy or in conjunction with therapy. It is almost impossible to deal effectively on your own with the effects of trauma and abuse, but having a supportive community and using the simple tools in this book can help you begin the journey toward healing." "Accessible, profound, and inspiring, the wisdom of Whole Again guides us inward to uncover deeply buried feelings and undigested pain that, left unaddressed, prevent us from experiencing our wholeness. Through consistent and cumulative practices, Jackson offers us a powerful, heart-centered, program that helps us heal, inhabit our lives more fully, and remember our wholeness." "Jackson MacKenzie so lovingly and transparently delves deeply into the trauma and sorrow that can stand in between us and our real selves. This groundbreaking, must-read book brilliantly and compassionately illuminates the path to healing. It is soul work at its finest." "A powerful and moving force for good, Whole Again is grounded in the author's own research and deep, knowing wisdom. Everyone should have this book on their shelf." "I've read many books over the years about recovery from abuse, both self-help and clinical, and WHOLE AGAIN is definitely one of the best. Though not a therapist himself, Mr. MacKenzie has done his homework. His descriptions of personality styles and disorders are not only accurate but also understandable. The book is filled with practical, well-researched and well-organized suggestions to aid the recovery process. It's clear that Jackson MacKenzie cares deeply about the unique sensitivities of each reader. I love this book." "This is a great book for recovering from any trauma or difficult relationship, including relationships with Cluster B personalities. As Jackson MacKenzie says, it's not what you think--it's what you feel. To thoroughly understand what that means, read this book. With this powerful information, anyone can become whole again." 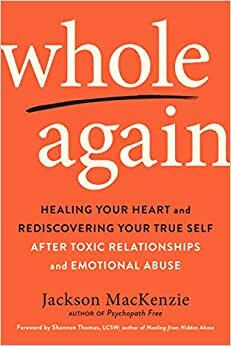 From a leading voice on recovering from toxic relationships, a deeply insightful guide to getting back to your "old self" again--in order to truly heal and move on. 5.0 out of 5 stars"Less Story, More Body"
This sequel to the seminal "Psychopath Free" delivers a forthright strategy to melt away lingering deep inner core shame and inadequacy due to the resulting bodily felt trauma of betrayal from a trusted loved one. Essentially, it's going inwards and turning towards the pain in order to release it and be done with it-- rather than our natural unconscious protective measures that keep us perceived "safe" by avoiding it in favor of external distractions that temporarily numb without ever resolving the reason that the shame stays on within us. Facing temporary sensations of discomfort in choosing to confront our inner wound pay off in a permanent reconnecting with our own personal unlimited source of heartfelt love and well-being that's our innate human birthright. MacKenzie did it once again in getting straight to the nitty gritty realism of the cluster b relationship aftermath as seen on the ground by someone who has lived through it himself. Complicated theory and speculations are all fine and dandy for the academic minded professionals, but the everyday laypersons who have had these experiences just want to know the practical necessities of how to put the whole mess behind us in order to get back to our business of living our best lives ASAP. Save time by giving him a listen and his ideas a try. I read one of this other books "psychopath free" and just had to order this one. Glad I did. Highly recommend if going through a narcissist or sociopath relationship and trying to be able to move on and find acceptance after it ends. It's a must have!! Easy read...very helpful! 5.0 out of 5 starsThis author knows what he's talking about! I read his first book, Psychopath Free and at the time I was in a toxic marriage, totally confused as to what had been happening over the last decade in the marriage. This book hit every single red flag I was experiencing and validated my experience, because I had no idea what was going on. If you feel you are in a toxic relationship, and need understanding, I highly recommend ANY of his books hands down. He understands ambient, extrovert and covert abuse from a victim and survivors viewpoint, and can help you understand the toxic person you're dealing with, and give you solid information on how to deal with it and what to expect. Toxic people are pathological and he helps you get that its not your fault and how to release yourself of the toxicity in your life. I picked up this book at my local Barnes and noble and gave it a bit of a read while there. It intrigued me from the very beginning and luckily I was able to find it on amazon for a few dollars cheaper (yay)! I haven’t been able to put the book down since it was delivered. I was at awe with how relatable I was with the author and the stories he told within the book. Grateful that I picked up this read!